If I were to earn a badge at summer camp, it would be for sewing with knits. 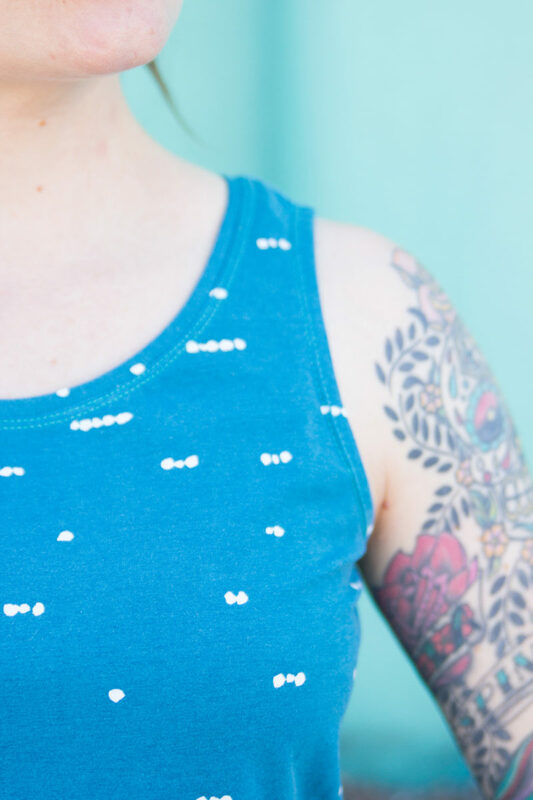 I have an uncontrollable T-shirt addiction, so when I first learned to sew, I jumped straight to the serger. Even if a pattern calls for woven fabrics, I’ll probably find a way to sew it in a knit, which is what I did for Sorbetto. I went down one size, got rid of the bust darts, and traded the pretty center pleat and bias tape for some cozy knit fabric and a neckband. In less than an hour, I had a brand new tank! When the bust darts are removed, Sorbetto has this really great swingy shape, perfect for lightweight fabrics like bamboo or rayon jersey. Since Sorbetto is designed for woven fabrics, you can use a thicker knit, such as ponte, if you want to maintain the original shape—I split the difference and chose a medium weight knit with a ton of stretch. 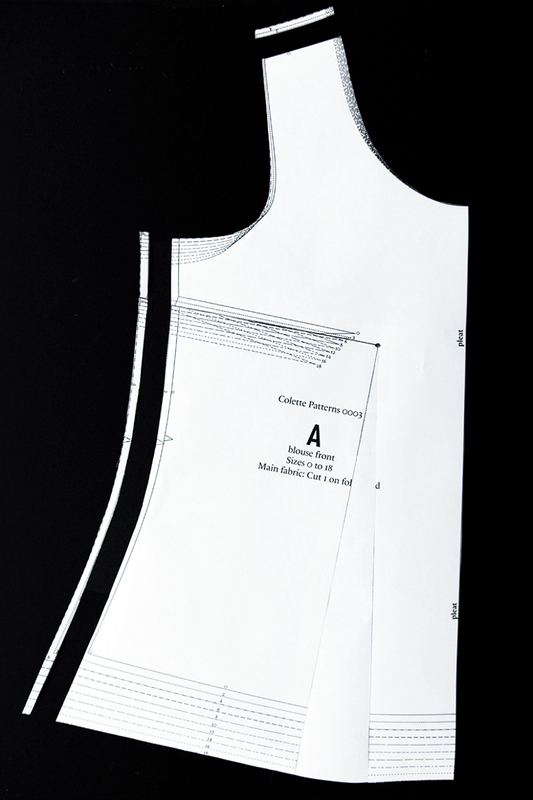 1) Using paper shears, cut along the line marked “pleat” on pattern piece A. This line is your new center front. 1) Mark a new bust apex 1.5″ out from the dart apex. Draw two lines, starting at the dart notch and ending at the apex. Call these lines A and B. 2) Draw a third line from the bust apex to the hem that is parallel to the center front. Call this line C. Cut along lines A and B all the way to the bust apex, removing the dart. 3) Cut along line C, starting at the hem but stopping just short of the apex. Now you have a hinge! Yay! 4) Pivot the lower side portion of the pattern until the dart is closed. 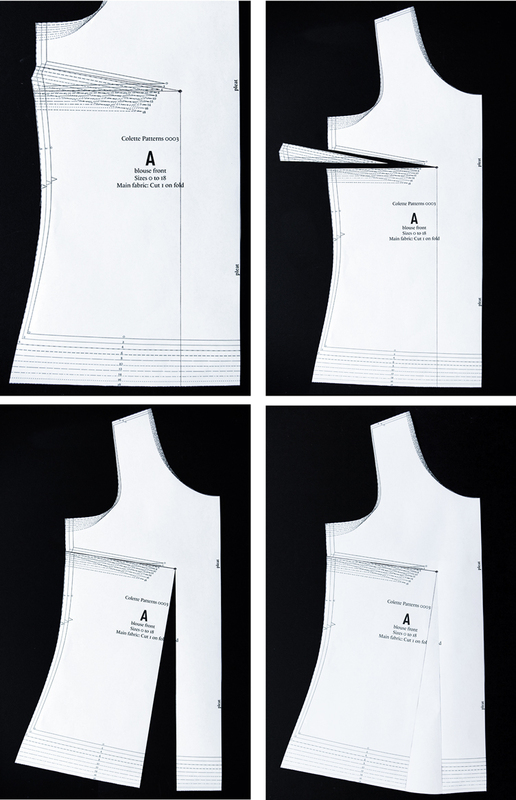 5) Use pattern paper to fill in the gap created by pivoting the dart and redraw the hemline. To make this pattern serger friendly, reduce the seam allowance of the shoulders and side seams by 1/4″ so that the seam allowance is 3/8″. 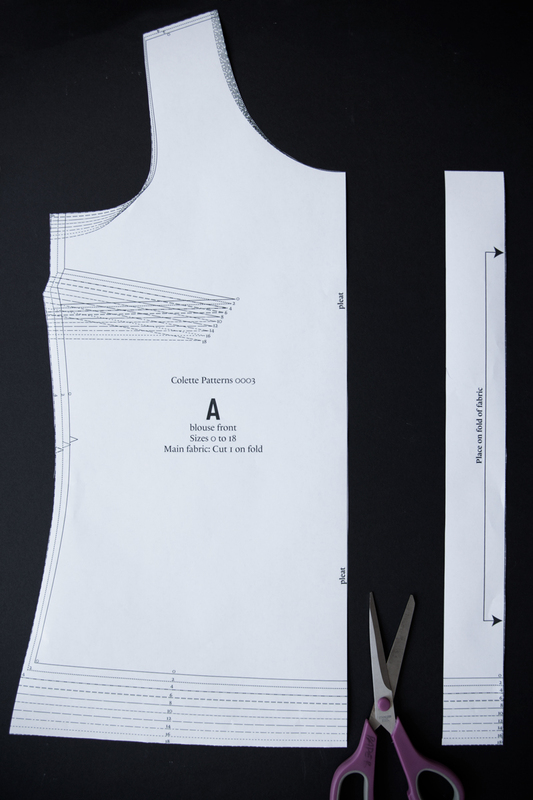 Since you can’t use bias tape on a knit version, there are a few other options for finishing the neckline and armholes. To learn 4 complete methods, check out our ultimate guide to binding knit edges. I’m a big fan of neckbands when sewing knits, so I used a neckband for my Sorbetto, finished with a twin needle. For the armholes, I used the clean finish binding method, also finished with a twin needle. 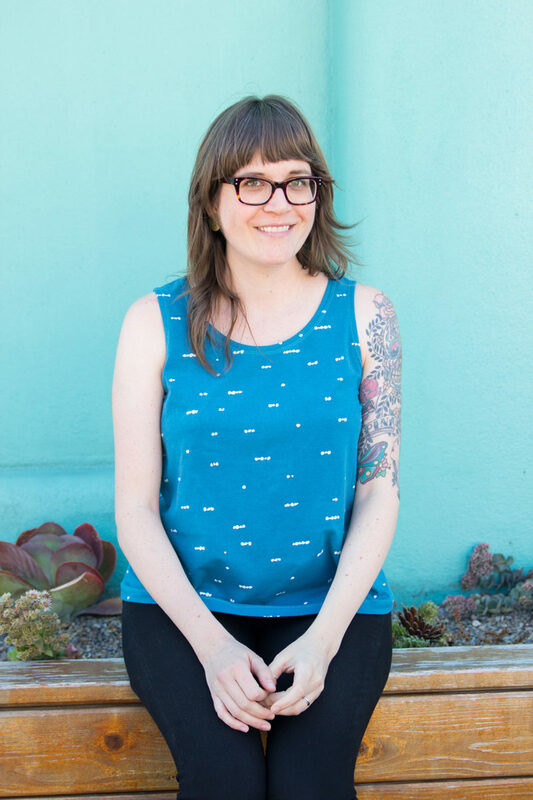 If you’re like me, and crave a knit version of all your favorite woven patterns, check out Christine Haynes’ article, “From Woven to Knit” to determine if your pattern is a fabric chameleon like Sorbetto. What about you? Are you team woven or team knit? Should we even pick sides? Was just hi King about making this in a knit. Off to the market on Saturday. Might add some sort of trim down the center, though… I miss the accent pleat! I think I might add a pleat of some kind to my next knit version as well! Planning on shopping for some knits today. Those are some beautifully finished edges! I need to try out a twin needle – when I catch up with the weeding. My twin needle is my best sewing friend! La! ( insert sound of angels singing.). I am in pattern love. What do you mean about needing a hip curve? Thank you. I have something called a French curve ruler. I’ll use that. I want to use a woven fabric. I have a small bust and a protruding tummy. 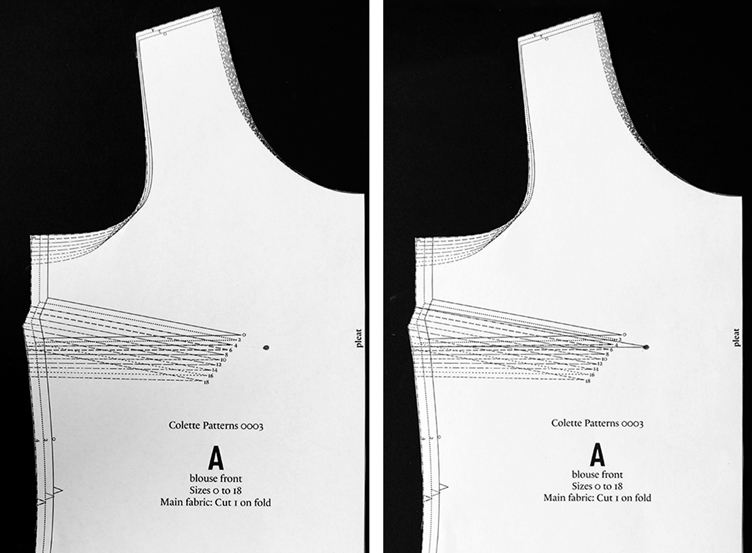 If I use woven fabric and remove the dart, is it feasible that I wouldn’t need to do an SBA, that the dart-free result might fit my bust better, and that the swingy shape would fit over my tummy better? It looks like your adjustment makes the bottom of the top wider than it was with the dart. Is that correct? It sounds like it might be ideal for my shape. Yes, removing the dart creates a wider shape at the hem. I’m biggest in my tummy, and I think it would work with a woven—I wouldn’t size down, though. I often remove bust darts in lieu of an SBA and it usually works for a simple pattern like this one. One more question. If I remove the dart, and use a woven fabric, can I keep the pleat? Yes, you can keep the pleat. Just follow the same steps to redraw your hemline so the center front is straight. I made the Sorbetto without the dart and kept the pleat. It was too short in the armhole and too tight in the bust. I used Size 4 for my 35″ bust. I made another one in a larger size and cut the armhole deeper. The top was still too small in the bust. Even thought I’m an A-cup, maybe I need the dart. Is that possible? I really like this top style and want one that fits me. On another note, I’m not at all experienced with bias tape. I put it on this blouse, but it seems to barely fit, and it gets out of alignment when I go over the seams in the blouse and the seams in the tape. Also, the neckline is now out of shape. I did do the required staystitching. Do you have any suggestions? Are there alternatives to bias tape and regular facings that come with most patterns? I know that regular facings can show through light fabrics, and I don’t like that, so is there anything else one can do? Thank you. While I have sewed darts in knits, it can be tricky. Are you making a woven version and wondering about the bust darts? If so, yes, I would keep them in. If it is still not fitting correctly in the bust, consider a FBA. 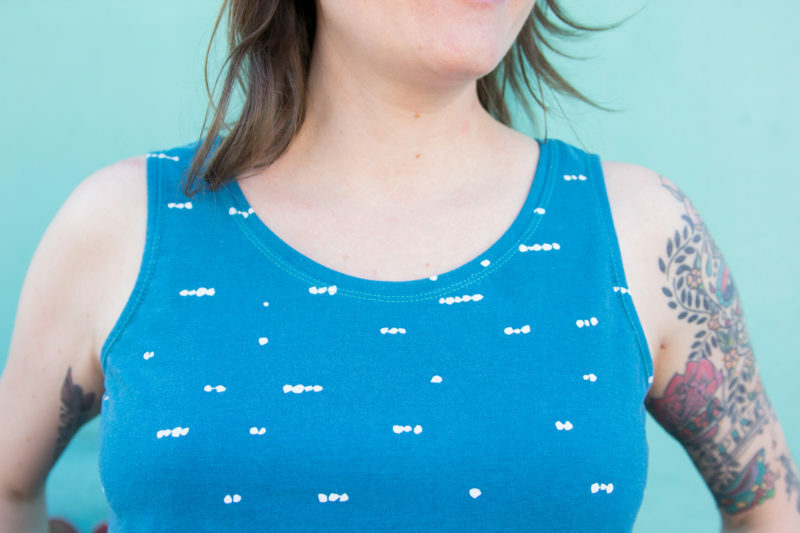 You could try lining your top if you really want to avoid bias tape. Although once you learn to master bias tape, you’ll never forget! Here’s a guide that I found helpful. Thank you, you lovely people ? Thank you, this is brilliant and so simple! And even better, I have some bamboo knit too! Didn’t realise there were so many other ways to finish of the neckline and armholes. Might just have to try all of them! ? Happy to help! A bamboo version would be so cool and breezy. I definitely recommend giving all the finishing techniques a try. You can even just experiment on little scraps to see which one you like best. Oh nice! I was thinking I needed some tanks to go under my thinner woven Sorbettos. But I hadn’t thought of making them from the pattern! I will have to give it a try! That’s a really great idea. I love layering! Late to the party but just wanted to add you could make the knit version, but keep the pleat as part of the pattern. Then, instead of sewing it as a pleat, you could just gather the center of the top front, so there are some gathers at the center neckline, flowing loosely over the bust area. Thanks for your reply about my problems fitting the Sorbetto top and for your advice about bias tape and facing. I will read that link. What fabric is this? The color is great! It’s an Art Gallery Knit, “Morse Dot“. It was a joy to sew! Hi – I made the woven version out of a drapey rayon – love, love, love it! So I decided to use up some knits left over from a couple of 1/2 circle skirts. I stitched up the first one last night and it is way large! I know I should have used one size smaller, but the result is a good 1 1/2 inches too large on each side seam for a total of 3 inches on the back and the front or six inches around the body. Is this possible? Has anyone else had this experience? Fortunately, it’s not difficult to take in, but I would like to make this again, so I’d like to get the pattern right for knits.